Perspective from here and over there. 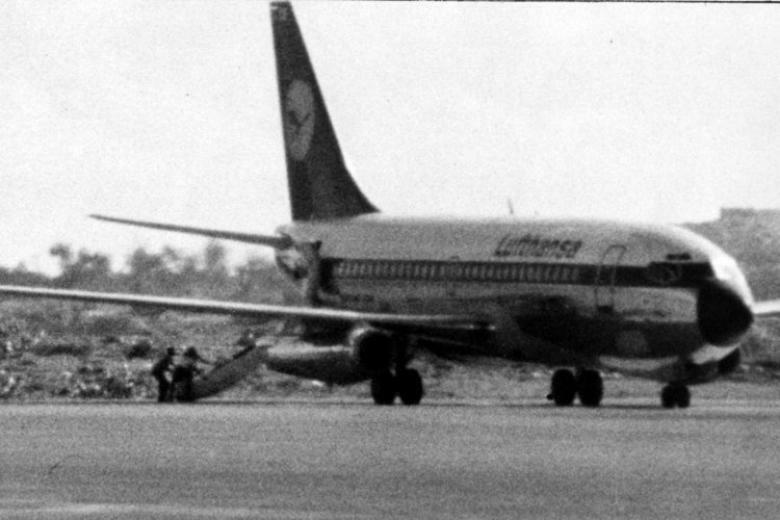 Above, the body of Lufthansa pilot Jürgen Schumann being removed from his plane in Mogadishu, 17 October 1977, after he had been shot on board the plane 4 days earlier in Aden. If you think ISIS has been been good at finding new ways to grab attention, such as their relic-destruction antics in Mosul, it would be worth reading about their 1970s predecessors, the Red Army Faction and their Arab allies -- allied over politics, not religion. ISIS may not recognize the precedent, but the mixture of calculated outrage and calibrated callousness looks very familiar now. Imagine what the affair of LH flight 181 would have looked like in today's media world. AP Photo via Die Welt. The news here is that previous Friedman usages of "decent" in discussing the Arab world had allowed for selected examples of decency there; the list varied but it tended to include Tunisia, Lebanon, Jordan, Morocco, and the United Arab Emirates. Now none of them are mentioned, all Islamic decency is apparently non-Arab. He's heading in a direction very much the opposite of the iconic Muslim Brotherhood slogan Islam is the Solution. For him, Arab Islam is the Problem. Given his role as a marker of the conventional wisdom, that's noteworthy. Kadhimi, the senior Badr official, said Iranian advisers in Iraq have helped with everything from tactics to providing paramilitary groups with drone and signals capabilities, including electronic surveillance and radio communications. "The U.S. stayed all these years with the Iraqi army and never taught them to use drones or how to operate a very sophisticated communication network, or how to intercept the enemy's communication," he said. "The Hashid Shaabi, with the help of (Iranian) advisers, now knows how to operate and manufacture drones."... Within two days of Mosul's fall on June 10 last year, Taghavi, a member of Iran's minority Arab population, traveled to Iraq with members of Iran's regular military and the Revolutionary Guard. Soon, he was helping map out a way to outflank Islamic State outside Balad, 50 miles (80 km) north of Baghdad. Taghavi's time with Saraya al-Khorasani proved a boon for the group. Its numbers swelled from 1,500 to 3,000. It now boasts artillery, heavy machine guns, and 23 military Humvees, many of them captured from Islamic State. "Of course, they are good," Yasiri said with a grin. "They are American made." We found the Khorasan Group, again! One of the Shi'ite militia groups that best shows Iran's influence in Iraq is Saraya al-Khorasani. It was formed in 2013 in response to Khamenei's call to fight Sunni jihadists, initially in Syria and later Iraq. The group is responsible for the Baghdad billboards that feature Iranian General Hamid Taghavi, a member of the Iranian Revolutionary Guard. Known to militia members as Abu Mariam, Taghavi was killed in northern Iraq in December. He has become a hero for many of Iraq's Shi'ite fighters. Taghavi "was an expert at guerrilla war," said Ali al-Yasiri, the commander of Saraya al-Khorasani. "People looked at him as magical." The group's inspirational figure may not have been magical. But unlike the "Khorasan Group," this particular entity with a similar name does exist. Reuters -- A deal worth 200 million euros ($228 million) has been signed to equip Eurofighter Typhoon combat jets with the latest Brimstone 2 surface attack missiles, Britain's Ministry of Defence (MoD) said on Sunday. The integration is expected to be delivered into service by Britain's Royal Air Force in late 2018, the MoD said, with each Typhoon able to carry six of the Brimstone missiles, which are designed to hit fast-moving targets and have already been used by Britain's Tornado jets in Afghanistan, Libya and Iraq. Why can't Greece be more like Belgium? Text: But in some countries debt and budgets were so far out of line that even serious adjustment where it did take place could not swing the balance. As a result there are now four problem debtor countries in Europe. Table 1.2 shows their situation. From Public Debt Management: Theory and History, 1990, edited by Rudiger Dornbusch (RIP) and Mario Draghi (Who? ), Cambridge University Press. 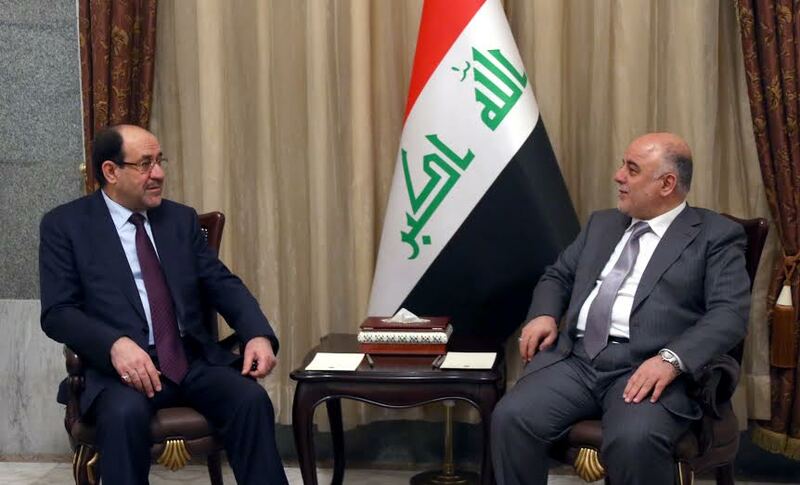 Former Iraqi Prime Minister Nouri al-Maliki -- whom all pundits denounce as the source of all Iraq's problems and now really everything will be different -- meets his successor Haider al-Abadi, on Sunday. The two discussed the government's plans, needed legislation, and plans to defeat ISIL. And by the way, that's Vice President Nouri al-Maliki. At this stage it's hard to find anyone who thinks the Obama administration strategy of avoiding discussing the Islamic nature of ISIS/ISIL is a good idea -- they've even lost Vox! One final note. Yesterday Secretary of State John Kerry was in London and delivered a few remarks at a news conference with Foreign Secretary Philip Hammond. In keeping with the ridiculous Euro-affectation about ISIS, he referred to the group, multiple times, as Daesh. 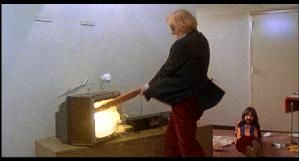 Which besides being like the cricket bat in Spinal Tap, is of course another way to avoid discussing their alleged Islamic characteristics. Image: Ian Faith via Rotten Tomatoes. A tire shop fire in Abu Dhabi late on Friday killed 10 foreign workers and injured eight others who were living in an upstairs apartment, the local Gulf News reported on Saturday. The blaze in the Musaffah district gutted the two-story building, which contained seven shops on the ground floor but was illegally used as workers' accommodation upstairs, the paper reported, citing police sources. "The 10 individuals who died were residing in the upper floor that was actually designed to be used as a warehouse, not a place of residence," the daily newspaper quoted the Interior Ministry as saying. Would it help the wider media awareness if an ISIS production crew had been available? Greece seemingly gave a lot of ground on the language: the stuff about fiscal adjustment in line with the November 2012 Eurogroup is back in, which Germany will presumably claim represents a commitment to stay with the 4.5 percent primary surplus target. Note: That November 2012 Eurogroup clause was in the earlier mystery draft agreement that was previously accepted by Greece. It's not where either side perceives the break points in a deal to be. Amid all the mostly feigned uproar about US State Department Deputy Spokesperson Marie Harf's remark to MSNBC's Chris Matthews that taking on ISIS would mean tackling "root causes," what's being lost is that the top of the list of root causes was "jobs" and not that the fact that ISIS burst into prominence from its base in Raqqa, Syria, as part of the rebellion against the President of Syria, Bashar al-Assad. No Bashar al-Assad repression, no ISIS. On my reading, here’s the key sentence: "The Greek authorities committed to ensure appropriate primary fiscal surpluses and financing in order to guarantee debt sustainability in line with the targets agreed in the November 2012 Eurogroup statement. Moreover, any new measures should be funded, and not endanger financial stability." Translation (if you look back at that Eurogroup statement): no give whatsoever on the primary surplus of 4.5 percent of GDP. There was absolutely no way Tsipras and company could sign on to such a statement, which makes you wonder what the Eurogroup ministers think they’re doing.I guess it’s possible that they’re just fools — that they don’t understand that Greece 2015 is not Ireland 2010, and that this kind of bullying won’t work. On this basis the Greek authorities expressed their intention to request a six months technical extension of the current program as an intermediate step. This would bridge the time for the Greek authorities and the Eurogroup to work on a follow-up arrangement. So the proposal was not that Greece was run large primary surpluses forever. It was that it would say enough along those lines to get a very short extension of the current program while a new one is being put together. Greece will fully respect its commitments to partners to ensure sound and sustainable public finances, by reaching and then sustaining sizeable primary balances. The feasibility of reaching the fiscal target for 2015 will be considered in light of evolving economic circumstances. Measures for reducing the debt burden and achieving a further credible and sustainable reduction of the Greek debt-to-GDP ratio should be considered in line with the commitment of the Eurogroup in November 2012. At the same time, the Greek authorities reiterated their unequivocal commitment to the financial obligations to all their creditors. There's nothing that stands out about those sentences as weaker than the version that has Krugman outraged -- both refer to the 2012 Eurogroup statement -- and in some respects they are tougher (note e.g. "sizeable primary balances"). Greece may well be on its way of the Euro. But Monday's meeting was sufficiently confusing that pitching grand theories upon it -- either that Greece is less wimpy than Ireland, or that the Eurozone is trying to kick them out of the Eurozone -- is a risky enterprise. As ministers were holding talks in Brussels, they received press reports of Greek officials in Athens rejecting a statement that had been prepared by Mr. Dijsselbloem earlier in the day. The statement committed Greece to seeking a six-month extension to its bailout deal, but giving it some leeway on the budget cuts and economic reforms it has to implement in return. Greek officials in Athens called the proposals “absurd and unacceptable,” adding that “there can be no agreement [on new financing] today.” “That contributed to the [already negative] atmosphere,” said the official present at the Brussels talks. Shortly after, ministers decided to end the meeting. In other words, the meeting had been called so that the Greeks would agree to issue a statement that had been prepared before the meeting even started! Advance statements prepared by the Sir Humphreys of the EU are of course business as usual during the entire Euro crisis. That's the problem. ISIS, already spanning Syria and Iraq, takes actions to draw in Jordan. It has a new Libyan affiliate which commits an atrocity resulting in the Egyptian President promising retaliation. And the Israeli prime minister keeps telling overseas Jews that they need to return to Israel. You could not write an end times conflagration better than these players are jointly collaborating upon. The Weather Channel is headlining: Main Event -- Winter Storms Neptune and Octavia. Thus illustrating the idiocy of naming winter storms: they form too quickly for names to be meaningful. You're going to remember which hurricane blew part of your house away. You're not going to remember if you blew out your back digging snow out of Neptune or Octavia. It appears that the Copenhagen anti-free speech shooter didn't understand the following context for his actions: he carried out the atrocity on a weekend and not just any weekend but a weekend in which TV rolling news is on Ukraine ceasefire countdown and Official Washington has already decamped from the austerity-wracked city for the ski resorts, cutting out that news amplifier, and it appears that Danish police, perhaps with Charlie Hebdo on their minds did enough -- at some cost to themselves -- to prevent a bigger atrocity. But also, like the Nigerian school girls, the Yazidis, the Syrian refugees, the Rohingya -- everyone else has already been through the healing process and moved on. The Ministerial Council called upon the UN Security Council and international community with the followings: - Urging the UN Security Council (UNSC) members to adopt a resolution under Chapter VII of UN Charter over the Houthis' 'illegitimate' seizure of power. - Taking urgent actions to ensure safety and health of President Abed Rabbo Mansour Hadi and Prime Minister Khalid Bahah, ministers and officials and release them. If only one of the Gulf countries had a seat on the UN Security Council so that they could directly raise this issue! As good a guess as any as what Irish finance minister Michael Noonan said to his Greek counterpart Yanis Varoufakis at the Eurogroup meeting last night. Why is it much more commented upon that the Greek Finance Minister Yanis Varoufakis doesn't wear a tie (and also doesn't tuck in his shirt) than when IMF Managing Director Christine Lagarde shows up to the same Eurogroup meeting in a multiply-zipped leather jacket? In this joint resolution, the term "associated persons or forces" means individuals and organizations fighting for, on behalf of, or alongside ISIL or any closely-related successor entity in hostilities against the United States or its coalition partners. Practical question: if Al Nusra Front -- which the US has already attacked under the guise of the bogus Khorasan Group appellation -- is determined to be fighting Iraqi militias sent to help Bashar al-Assad, does that mean the AUMF would allow US action against Al Nusra Front, since Iraq is a member of the coalition? President Obama is being subject to anti-Semantic attacks over his mangled characterization of the Paris Kosher Hypermarket attack in the "interview" with Vox media. In fairness to Vox, Jack Shafer at Politico rightly slammed the questions, but should have left open the possibility that an unnoticed gaffe would turn out to be real news from the interview. BANGKOK — Not a single shot has been fired by the military since generals overthrew a democratically elected government here last May. Instead, they have depended on the force of paperwork, reams of it, to bring their opponents under control. Hundreds of people have been summoned and forced to sign documents that allow the junta to seize their assets if they become involved with “any political movement.” Stacks of case files clutter the headquarters of the National Anti-Corruption Commission, which is pursuing at least seven legal cases against the former government and threatening legal action against hundreds of former members of Parliament overthrown in the coup. In my piece today, I mention that five of the nine Supreme Court justices went to the same law school — Harvard — with three of the remaining four having gone to Yale and one — Justice Ginsburg — having gone to Columbia. Ginsburg, I wrote, is always an outlier. Ed Whelan writes in to correct me: Ginsburg spent the first two years of her law-school career at — surprise! — Harvard, before transferring to Columbia. According to Wikipedia, which never lies, she did this for the charmingly old-fashioned purpose of following her husband, who had taken a job in New York. Which is to say, the intellectual homogeneity of our nine-member national super-legislature is slightly worse than I had suggested. The common thread is here that what seemed like an open-ended belief in that the rule of law would make societies better is slowly being seen to have created a rule of lawyers -- another self-interested class which can be rented out by the powers that be. Ireland has been afflicted by this for a while, but hasn't realized it yet. As we all saw in Rio, Angela is one of her team’s biggest fans. Our U.S. team, however, gets better each World Cup, so watch out in 2018. The 2018 FIFA World Cup is in ... Russia! It's probably funny to Vladimir Putin to watch Germany, France, and the US spin themselves into a frenzy over a potential deal on Ukraine at a summit on Wednesday, while he embarks on a leisurely 2-day visit to Egypt -- seen here being met by President al-Sisi. Does Putin look to be in a hurry to do a deal? Saxo promotes a vision of individual responsibility free from government intrusion. The firm hands out copies of “Atlas Shrugged,” Ayn Rand ’s hymn to individualism and capitalism, to employees and clients. It offers a free copy of the Danish translation of the novel to anyone who fills out a form on its website. But Saxo’s move to reprice trades runs contrary to some its own marketing materials. On its website, it promises “dedicated liquidity” and “no slippage” to users of its foreign-exchange trading platform. Of course, some of the clients probably bought into that sales pitch. We will help countries in transition make political and economic reforms and build state capacity to maintain security, law and order, and respect for universal rights. In this respect, we seek a stable Yemen that undertakes difficult structural reforms and confronts an active threat from al-Qa’ida and other rebels. Reuters today -- Yemen's dominant Houthi movement dissolved parliament on Friday and said a new interim assembly and government would be formed, a move denounced by a main political faction as a coup. Sadly, this is not the case today, and nowhere is the violence more tragic and destabilizing than in the sectarian conflict from Beirut to Baghdad, which has given rise to new terrorist groups such as ISIL. Lebanon has severe and debilitating sectarian tensions, but is not in sectarian conflict. At the same time, we are working with our partners to train and equip a moderate Syrian opposition to provide a counterweight to the terrorists and the brutality of the Assad regime. Yet, the only lasting solution to Syria’s civil war remains political—an inclusive political transition that responds to the legitimate aspirations of all Syrian citizens. (Reuters) Syrian air force strikes killed 82 people in an opposition district outside Damascus following rocket attacks by rebels that hit the government-controlled center of the capital, a monitoring group said on Friday. The Syrian Observatory for Human Rights, which monitors the war in Syria, said the air force conducted 60 strikes on the Eastern Ghouta district on Thursday and into Friday. Eighteen children and 11 fighters were among the dead, it said. The White House strategy never addresses how their current approach can be effective when the Assad regime has that kind of impunity. Not surprisingly, the strategy fact sheet doesn't even mention Syria. At least he didn't say "inflame"
Islamic State's burning to death of a captured Jordanian air force pilot is likely to harden Jordan's position as a member of the U.S.-led coalition striking the militant group in Syria, U.S. officials said on Tuesday. The officials, speaking on condition of anonymity, said Jordan has not retrenched from the air campaign against Islamic State since the group captured pilot Mouath al-Kasaesbeh after his jet crashed in northeastern Syria in December. One official said he expected al-Kasaesbeh's killing "to have an electrifying effect" on Jordan. There've been so many events over the years that have supposedly strengthened our resolve, it's a wonder that any terrorists are left at all! War has a way of making stupid and depraved atrocities look calculated and even strategic. So it was with Abu Musab al-Zarqawi -- diabolically brilliant, according to Condi Rice. And so it is with Zarqawi's successors, ISIS, who appear to have murdered Jordanian POW First. Lt. Moaz al-Kasasbeh by burning him alive. In all likelihood, on a day when Jordanians might have been asking why their King is paying massive hotel bills for Chris Christie, they'll instead rally around the government and perhaps support a punitive response. But even on those terms -- ISIS wants war, so they got it -- was it really their best move to kill their trump card in terms of splitting Jordan internally and from its allies in negotiations to get Moaz released? UPDATE: Among the issues raised by the timeline of the pilot's murder is where the idea came from of swapping him for the Iraqi suicide bomber Sajida al-Rishawi. Days apart, the New York Times had one article reporting the general mystification about why ISIS would ask for a no-name prisoner in exchange, and another reporting that several weeks ago, it was the pilot's own tribe which suggested the idea. Islamic State grew out of the Sunni-Shia conflict in Iraq and the civil war in Syria, in which an estimated 200,000 people have been killed since 2011. The Syrian Observatory for Human Rights monitoring group said on Tuesday that 51 civilians, including children, had been killed by Syrian air force strikes inside the country within the past day.